Parents educators, and world health professionals are concerned. Today's kids are heavier than ever -- their activity levels are lower than those of generations past and they tend to consume diets loaded with fat and sugar, but sadly lacking in nutrients and fiber. It's even been said that the children born today are the first generation to actually have a lower life expectancy that of their parents. That is a sad statement, but one that doesn't have to prove itself to be true. If parents and others who care for children dedicate themselves to seeing that the kids in their lives eat well and get plenty of exercise, childhood obesity statistics can improve. Experts say that today's kids spend far too much time watching TV and playing video games, and advise parents to find ways to engage their kids in more active endeavors, such as dance. There are interactive dancing video games (for arcades and home gaming systems) and is quite popular with older kids and teens, but traditional dancing such as ballet, jazz, tap, and Irish dancing are enjoyed, as well. Dance provides kids with great workouts, improves muscle tone, flexibility and coordination, and is often a terrific social outlet. The dancing games are based on simple concepts of following directions on a screen for foot placement, excelling at these games takes lots of practice. Beginners are advised to listen to the beat of the music and let it guide them to their steps. While the direction of the arrows changes, the beat remains steady. Expert players also recommend that newbies learn to focus their attention on the arrows as they are introduced, rather than waiting for them to reach the top of the screen. New players are sure to make mistakes (even seasoned DDR players trip up once in a while! ), but with persistence, these games can be fun ways to get terrific workouts. The single most important piece of advice that great players can offer to beginners? "Practice!". Today's kids are undoubtedly a video generation, but that doesn't have to be all bad. There are many great videos on the market today designed to get kids up and dancing, rather than sitting glassy-eyed, glued to the couch. From simple creative movement videos aimed at preschoolers to instructional "virtual dance classes," the basics of most every category of dance can be learned by watching and practicing along with dance videos. Ballet, tap, hip hop, jazz, and even celebrity hosted "dance parties" are just a DVD away. 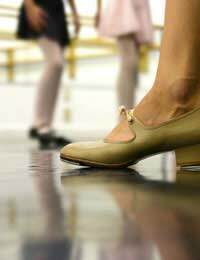 Many kids enjoy taking dance lessons and at some studios, classes are available for kids as young as two. Beginner ballet and tap are popular, and few things are cuter than a group of little ones learning Irish Dance. Small kids are usually excited to try different kinds of dancing and as they grow, many will find a specific type of dance that they particularly enjoy. When they are very young, the focus should be on fun rather than on perfecting performance, so parents should seek instructors who are easy going and fun loving. As children mature, they can work on their form, approaching their dance lessons with more seriousness. Kids, music, and movement are natural buddies. Small children are happy to dance with their parents, just having fun and being silly. As their children get older, parents may want to consider hosting dance parties, allowing kids to invite small groups of friends over for an afternoon or evening of music, dancing, and snacks. Shows like Strictly Come Dancing have increased public interest in dance, with people of all ages awed by the moves of dancers. Kids (and families) can certainly dance along to such shows, which is far better than merely watching. Even teens enjoy such get-togethers, as long as parents provide them with a bit of adult-free space. Of course, parents must be present and should check in on the kids, but as long as they are behaving themselves, teens should be allowed to dance and socialise without Mum and Dad looking on.